A snapped bass string wasn’t enough to spoil the night as unsigned heavy rock band Nights Tribunal dominated the crowd with their newly released five song EP. Each member of Nights Tribunal took to the stage on Thursday night. 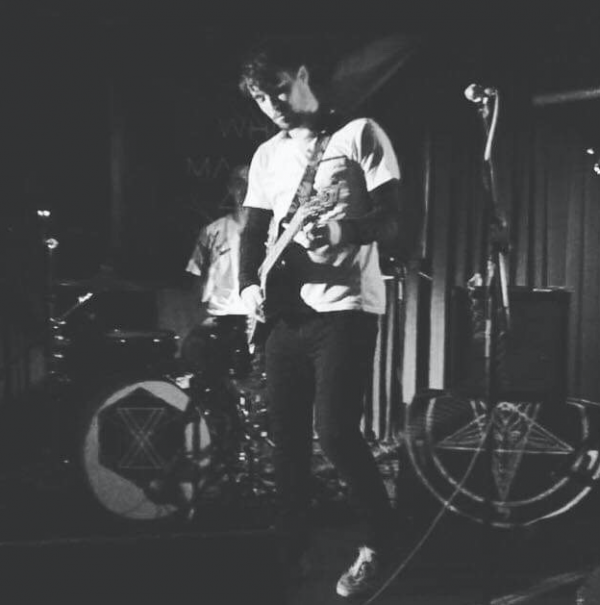 Drummer, Jack Liversage performing in the bands white merch t-shirt, which the band released in July. The crowd, mainly full of heavy rock fans, were instantly captivated as the three-member band performed their first song ‘Curtains closed for the execution’, filling the small venue with intense rock. Following this strong opening the Chester based band performed a series of songs from their newly released EP CU-45, including ‘Ivy League’, Unfiend’ and ‘Fame Game’. Several rock fans moshing along to the riffs played by lead singer and guitarist Ryan Bond. It was during ‘Fame game’ Mike Bolam’s bass string snapped but the crowd showed their support with an uproar of noise. Bolam continued the song, only using the three remaining strings. Finishing their set with their new release ‘Maple Grove’ the venue was filled with an electric atmosphere, with no surprise that the crowd was hyped for the next band ‘White Mammoth’ who were due on stage after Nights Tribunal. Nights Tribunal are currently working on their next EP, which is set to be released in 2019 and will be accessible on all major streaming platforms, following some Manchester and Liverpool gigs, yet to be announced.